The Crane Aerospace & Electronics facility in Lynnwood is one of our area’s more established aerospace suppliers. 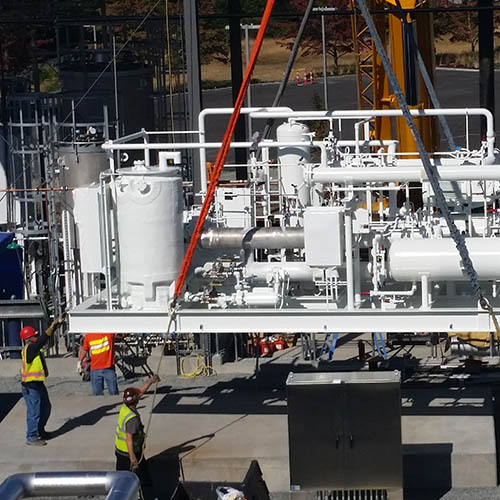 Auburn Mechanical was the mechanical contractor on their new 12,000-SF building to develop and test the fuel flow meters used to measure the amount of fuel an aircraft’s jet engines use. These fuel flow meters are part of the LEAP-X engines that will power the Boeing 737 MAX jets. This industrial facility had several unique components that made up the mechanical scope of work, such as a Cryogenic Chiller that was capable of cooling to -87 degrees, stainless steel jet-fuel piping capable of delivering fuel at 325 degrees, and underground, welded containment piping. This project took a high degree of care due to the unique equipment and systems, aggressive schedule, and design challenges.